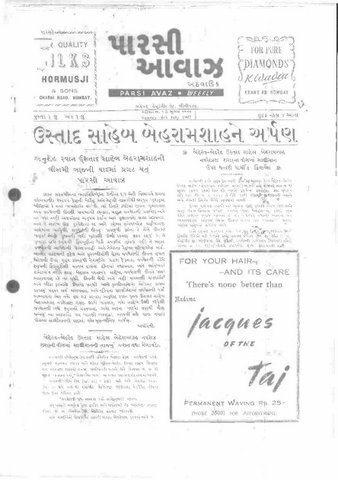 An alphabetical index of the complete Parsi Avaz articles, with Volume, issue and page number references, page 1 to page 94. An index of translations and commentaries of various Yashts appearing in the Parsi Avaz and other Khshnoom books: page 95. An alphabetical index of the writings of Dr. Saheb Framroze Chiniwalla appearing in the Parsi Avaz: page 96 to page 101. An alphabetical index of articles relating to Shah Behram Varzavand appearing in the Parsi Avaz: page 102 to page 103. An English rendering by me of the index of the writings of Dr. Saheb Framroze Chiniwalla with the volume and issue numbers, arranged chronologically: page 104 and page 105. An English rendering by me of the index of the writings of Dr. Saheb Framroze Chiniwalla with the volume and issue numbers, arranged topic wise: page 106 and page 107. This is an invaluable resource for researchers and serious students and even for casual readers to understand the depth and magnitude of education material of Khshnoom available over the years and now finally digitized and accessible to all.